Beijing makes it clear that it sees George Soros as a threat and warns him from shorting the yuan in an op-ed published by the Chinese Communist Party’s mouthpiece. Not long after billionaire George Soros forecast a so-called hard landing for the Chinese economy, Beijing fired back by calling out the high-profile investor, warning him of betting against its currency, according to media reports Tuesday. “Soros’ challenge against the renminbi and Hong Kong dollar is unlikely to succeed, there is no doubt about that,” said a government official in an opinion piece widely cited by several media outlets. The article headlined, ”Declaring war on China’s currency? Ha ha,” was published by the People’s Daily, the official newspaper of the Chinese Communist Party which is widely viewed as Beijing’s propaganda tool. Reports of the People’s Daily’s article follow Soros’ recent prediction that a precipitous slowdown in the Chinese economy is inevitable. “A hard landing is practically unavoidable,” Soros told Bloomberg Television last week on the sidelines of the World Economic Forum in Davos, Switzerland. “I’m not expecting it, I’m observing it,” he said, referencing his China outlook. Soros’ ties to seismic currency bets date back to 1992 when he accurately wagered that the pound would fall in value, forcing the British government to withdraw the currency from the European exchange rate mechanism. He also successfully bet against the Thailand baht ahead of the Asian financial crisis in 1997, which pushed several Asian economies to brink of sovereign default. Although Soros hasn’t directly threatened to bet against China’s yuan, his reputation as the investor who broke the Bank of England might have been enough to draw Beijing’s attention. Soros has been vocal about China’s recent economic woes, going as far as to warn that global markets are headed for a crisis akin to 2008 as China scrambles to find a new growth model. Beijing’s admonishment to Soros marks the latest effort by the Chinese government to crack down on those it views as speculators trying to upend its market. Soros didn't respond to a request for comment via email and a call placed to China’s Ministry of Finance wasn’t answered. The yuan USDCNY, -0.0638% which fell 4.7% in 2015, FactSet data show, is expected to slide further to 7 yuan versus the dollar by the end of the year from 6.58 currently on mounting worries about the Chinese economy, according to Deutsche Bank analysts. Beijing authorities unexpectedly devalued the yuan in August in response to slumping exports and indicated that it would introduce further changes on how to value the currency against its peers which analysts believe will give the government more flexibility in gliding the yuan lower. Worries about China have persisted into 2016, playing a key role in wiping out some $3 trillion in market cap in the first week of the year. It isn’t just Soros expecting a rough patch for China. Most economists forecast China’s gross domestic product to grow in the 6%-range due to the country’s slowing manufacturing activity. Europe’s ATMs worked overtime in 2015. A record 1.08 trillion euros ($1.17 trillion) of banknotes were in circulation, almost double the value 10 years ago, according to data compiled by the European Central Bank. That’s a counterargument to some bankers who say that electronic forms of cash will replace paper money sooner rather than later. 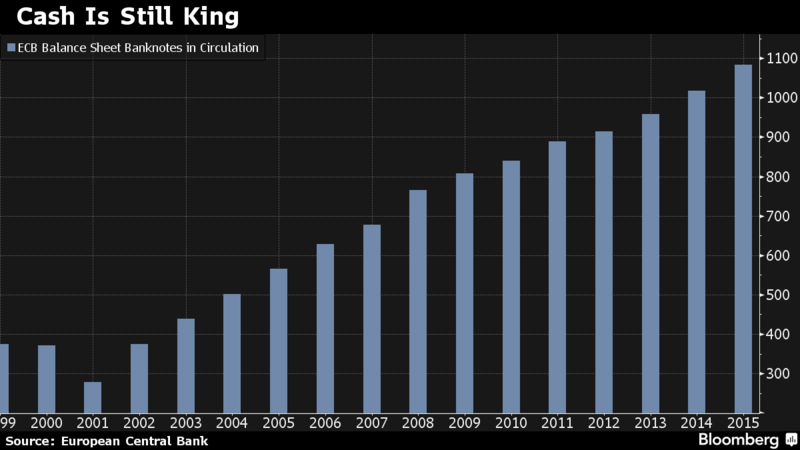 The value of banknotes in circulation rose 6.5 percent last year, the most since 2008. There are financial reasons - including negative rates on deposits - but part of the increase could be related to the influx of refugees, who don’t have bank accounts. about more turbulence on financial markets are driving cash holdings,” said Johannes Mayr, an economist at BayernLB in Munich. ECB Balance Sheet Banknotes in Circulation, value of notes in billions of euros. While China’s ghost cities are now a well-known occurrence – massive empty spaces built “Fields of Dream” style for when ‘they’ come from the countryside – the following massive 500,000 square meters of ‘Ghost Pentagon’ surely takes the proverbial biscuit when it comes to mal-investment mania. As The BBC reports, the Pentagonal Mart – a shopping mall in Shanghai built in 2009 – inspired by the Pentagon in the United States – has now gained the dubious title of China’s largest empty building. After a rally Friday, oil is tanking again Monday morning. Oil rocketed 8% on Friday, boosting stock markets around the world. Both Brent and US crude were trading higher in early trade Monday. But at 9:30 a.m. GMT (4:30 a.m. ET), the price was diving again. US crude is down 2.53% at $31.38. DNB, the bank with the proposal, has said eliminating the use of cash would cut down on black market sales and crimes such as money laundering. “Today, there is approximately 50 billion kroner in circulation nd [the country’s central bank] Norges Bank can only account for 40 percent of its use. That means that 60 percent of money usage is outside of any control. We believe that is due to under-the-table money and laundering,” Trond Bentestuen, a DNB executive, told Norwegian website VG, the Local reported. The country has already moved in this direction naturally. Bentestuen estimated that about 6 percent of Norwegians use cash on a daily basis, with the numbers higher among elderly people. Still, the Finance Ministry has no plans to change its laws for now. “There are many, including the elderly, who still want to use cash and that must be allowed. Moreover, it isn’t unproblematic for privacy to make every transaction traceable,” Finance Ministry spokesman Tore Vamraak said, according to the Local. Have you made mistakes regarding your credit in the past? That could haunt you ... for a long time. A whopping 68 percent of Americans make at least one major financial mistake, or "credit fumble," before turning 30, leading to a negative mark on their credit report, according to a Credit Karma survey. The survey, released Thursday, found that 3 out of 4 respondents believed their credit-related mishaps have had a negative impact on their lives. "These early mistakes can have a lingering impact on the quality of people's lives, and we feel that with better, targeted education and learning tools for new-to-credit consumers, this cycle can be broken," Kenneth Lin, Credit Karma's founder and CEO, said in a statement. There are many reasons why someone may end up with a negative mark on their credit history, but the biggest one is lack of education, Credit Karma found. More than 50 percent of respondents said they had received their first credit card by age 21, but 72 percent said they had received no education about personal finances before going to college. Hardeman said consumers should know "the long-term ramifications before you take out a credit card or take out a loan." Consumers also need to understand how their overall credit works, said Sean McQuay, credit cards expert at NerdWallet. LONDON (Reuters) - A British parliamentary committee will ask Google to testify about a back tax deal under which it will pay 130 million pounds ($185 million) to settle claims covering a 10-year period -- an amount the opposition Labour party has described as derisory. Meg Hillier, the Labour party chairwoman of parliament's Public Accounts Committee, tweeted at the weekend she would call Google, now part of holding company Alphabet Inc, and the UK tax authority (HMRC) to explain the "cosy deal". Google said it was a fair deal and that it complied with all tax rules. HMRC said the deal meant Google "will pay the full tax due in law." Finance minister George Osborne said the agreement represented a victory for the action the government had taken against corporate tax avoidance. Prime Minister David Cameron’s spokesman described it as "a step forward" but acknowledged there was more to do to ensure companies paid their fair share. Corporate tax avoidance has prompted anger in recent years among citizens who question whether the burden of paying the cost of combating the financial crisis was evenly shared. A study conducted by accountants PricewaterhouseCooper for the 100 Group, a lobby body representing around 100 of the biggest UK companies, showed their combined corporation tax bill was half 2010 levels in 2015, despite rising profits. Businesses say they benefit the exchequer in other ways such as collecting VAT (sales tax) on behalf of the government and employing staff who pay income taxes. Google's tax deal brings its total UK tax bill over the period to around 200 million pounds. Over the period, its total of around 24 billion pounds in UK revenues would have generated a tax bill of almost 2 billion, if the UK unit reported taxable profits in line with group margins of around 30 percent, according to Reuters calculations based on Google filings. Google's tax bill is reduced because profits from its European sales are channeled to Bermuda. Google says its Bermuda operation does not impact the tax it pays in the UK. Executives say the reported UK profit margins are far below the group average because most of its algorithms and codes, which drive the company’s profits, are developed outside the country. In 2013, the company faced a parliamentary inquiry after a Reuters investigation showed the firm employed hundreds of salespeople in Britain despite saying it did not conduct sales in the country, a key plank in its tax arrangements. Oriental is hardly alone. Wal-Mart Stores Inc. said on Jan. 15 it would be closing all 102 of its smaller Express stores, many in isolated towns, to focus on its supercenters and mid-sized Neighborhood Markets. The move, which will begin by the end of the month, was a relatively quick about-face. As recently as 2014, Wal-Mart was touting the solid performance of its smaller stores and announced plans to open an additional 90. That’s a big problem for small towns, often with proportionately large elderly populations. For the older folks of Oriental -- a retirement and summer vacation town along the inter-coastal waterway -- the next-nearest grocery and pharmacy is a 50-minute round-trip drive. Wal-Mart has been under increasing pressure lately as sales in the U.S. have failed to keep up with rising labor costs. It’s also been spending more on its Web operations. In October, the company announced that profit this year would be down as much as 12 percent. The outlook contributed to a share decline of 29 percent during the past 12 months. Towns like Clearwater, Kansas, and Merkel, Texas, are among those hit by Wal-Mart closures. In Godley, Texas, with a population of roughly 1,000, Wal-Mart opened a small store just a year ago. Within months, the only other grocery store in town -- Brookshire Brothers, part of an employee-owned regional chain -- shut its doors. Now with Wal-Mart gone, the closest full-service grocery store is about a 20-minute drive away. Residents of Oriental, where some city officials originally tried to block Wal-Mart from opening, are hoping for a similar outcome now that the megastore is gone. But for the moment the damage has been done, they say. Renee Ireland Smith, who ran Town’n Country, said the store immediately saw sales fall by 30 percent once Wal-Mart opened in May 2014. Whenever her store cut prices, Wal-Mart would reduce its prices even more. Smith’s mother, who owned the store, invested $100,000 in savings into the doomed effort. But by October, the family decided to cut its losses and close the business. Marc Faber, editor and publisher of “The Gloom, Boom & Doom" report, says the Chinese economy is growing at a much slower pace, closer to 2-4 percent, that's what its government is indicating. Q: How do you read the picture right now? You are bearish on China and I don’t think that 6.9 percent gross domestic product (GDP) number is something that you were in agreement with, now we have central banks hinting at some kind of action, there are experts talking about action in Japan and of course in the ECB, how do you read this fall that we have seen so far in January and just the overall set up? Marc Faber : Basically the market in the US began to decline a long time ago if you look at the average stocks in the US. It is down over the last 12 months by 26 percent from their highs, the average stock but the indices held up very well until the end of December because the indices do not reflect what is happening in the market. For example, you have an index, you have 500 stocks, if three stocks are very strong, they can push up the index while 497 stocks go down. So we have to look at the market beneath the surface and beneath the surface there was already a bear market in the US for a long time, for a year or more but there are some stocks and maybe another 20 shares such as Facebook, Amazon, Google that were driving and keeping the index up. The interventions by the Central Banks have a numerous unintended consequences - they lead to rise in stock prices. But for many people, this is not favourable because particularly in real estate, the affordability becomes an issue, they don’t have the money to buy expensive homes and so the home ownership rate in the US has been way down. Donald Trump is making a bold prediction about black voters. In an interview airing Sunday on Fox’s “Media Buzz,” Trump told me there is already great affection for him in the black community. “Look, the African Americans love me because they know I am going to bring back jobs,” he told me at the Trump International Hotel in Las Vegas. The statement was so audacious that it took me a split-second to react. The billionaire didn’t back off. “I think that relatively speaking - I mean he does have a slight advantage in all fairness- but I think relatively speaking when I am finished I think they will absolutely love Donald Trump,” he said. Keep in mind that most blacks routinely vote for Democrats. Ronald Reagan once got 14 percent of the African-American vote and it was considered a triumph. There was one poll last fall that showed Trump with 25 percent support among blacks, but it would be a shocker if those numbers held up. In the interview, Trump told me he has cut back his attacks on members of the media as losers and idiots because the press is treating him with more respect, mentioning the Wall Street Journal editorial page and a recent Time cover story. Soon after we wrapped the interview, though, National Review attacked Trump as a menace to American conservatism, and he responded by calling it a failing publication with little influence. It was as if things had suddenly returned to normal. ANCHORAGE, Alaska (AP) — A magnitude-7.1 quake knocked items off shelves and walls in Alaska early Sunday morning, jolting the nerves of residents in this earthquake-prone region. There were no reports of injuries, but four homes were lost to explosions or fire following the quake. The earthquake was widely felt by Anchorage residents. But the Anchorage and Valdez police departments said they hadn't received any reports of injury or significant damage. Vincent Nusunginya, 34, of Kenai said he was at his girlfriend's house when the quake hit. Two homes in Kenai were destroyed in gas leak explosions and the other two were fully engulfed before firefighters determined it was safe enough from gas for them to enter the homes, Kenai battalion chief Tony Prior said. He said firefighters focused on keeping the flames from those homes from spreading to nearby houses. "No injuries. Thank God," he said. "The second one was a major explosion. We're fortunate that no one was hurt." About 30 homes were evacuated, and some people took shelter at the Kenai National Guard Armory. Workers with the gas utility were examining the remaining homes Sunday afternoon with the goal of getting displaced residents back in their homes later in the day. The USGS initially reported the quake as a magnitude-7.1, but downgraded shortly afterward to magnitude-6.8 before raising it back to 7.1. "Some earthquakes have challenges associated with them, they are unusual or hard to monitor," West said. "This is neither of them. Southern Alaska is well instrumented, and this earthquake is of the style and type that we would expect in this area." The biggest aftershock Sunday was 4.7, and West said a magnitude-5 or magnitude-6 aftershock is possible. There were reports of scattered power outages from the Matanuska Electric Association and Chugach Electric in the Anchorage area. The Homer Electric Association reported on its website that about 4,800 customers were without power early Sunday in the Kenai Peninsula. The hashtag #akquake trended early Sunday on Twitter as people shared their experiences and posted photos of items that had fallen off walls and shelves. Andrea Conter, 50, of Anchorage, said she was surprised by the quake's strength. "This was a wild one," the former Southern California resident said. "I looked at the closed-circuit cameras at work and it lasted over 50 seconds and that is considerable for an earthquake." "When I bought my house in Anchorage I had a geological map that shows what are the sturdiest parts of town and there were a few where I said, 'If there's an earthquake, that house is toast,'" Conter said. "That's how I chose my house. Literally. Drove my real estate agent nuts. But, I didn't have one thing fall in my house. It was kind of clutch." Andrew Sayers, 26, of Kasilof was watching television when the quake struck. "The house started to shake violently. The TV we were watching fell over, stuff fell off the walls," he said. "Dishes were crashing, and we sprinted toward the doorway." Later, he was driving to his mother's home when he came across a stretch of road that was damaged in the quake. "We launched over this crack in the road. It's a miracle we didn't bust our tires on it," he said. After reaching his mother's house, Sayers checked on his grandparents, who live about a mile away. "No damage, except their Christmas tree fell over," he said. Associated Press writers Rashah McChesney in Juneau and Michelle A. Monroe and Tarek Hamada in Phoenix contributed to this report. HOWARD KURTZ: When you bash the media , and you have been treated unfairly at times portrayed as somebody who scares little children, but isn't that in your interest to do that? Your base loves that. They don't like the mainstream media. CRUZ: Almost without exception they have a partisan agenda. And we understand - let's take a substantive issue: police officers. If you have one police officer somewhere who does something he shouldn't have, the press will breathlessly report on this terrible, horrible police officer and all the democratic politicians will jump in and demonize and vilify the cops. Let me ask you something? How come the press doesn’t tell stories of heroism? The great news is we don't live anymore in a world of three networks that have a stranglehold on information. We have got the internet. We have got the Drudge Report. We have got talk radio. We have got social media. We've got the ability to go directly around, and directly to the people. Alphabet could soon become the most valuable company in the world. The Google powerhouse traded on Friday morning with an equity value above $500 billion, less than 10 percent shy of Apple’s value. Investors value the search firm’s earnings from rapidly growing digital advertising more than twice as highly as Apple’s in a saturating smartphone market. Wall Street, however, may be overlooking Alphabet’s risks. Global smartphone sales growth slowed to 10 percent last year, according to the consulting firm IDC. Reports of cutbacks at Apple suppliers suggest tepid demand for its latest phones. Analysts fear that the company may struggle this year to match the 230 million or so iPhones sold in the last fiscal year to September. An oversupplied market could bring price wars, which could hurt margins — and the iPhone accounts for about 60 percent of Apple’s revenue and a bigger chunk of its profit. As a result, investors expect little growth in the company’s top line this year and are paying only about 10 times estimated 2016 earnings for the stock. The mobile digital advertising market, meanwhile, should almost triple to nearly $200 billion globally by 2019, consultants at eMarketer reckon. Alphabet’s sales are forecast to grow about 15 percent this year. This wind at Alphabet’s back and the possibility that its self-driving cars, robots or medical endeavors will pay off help explain why it commands a price-to-earnings multiple above 20. A subpar earnings report from Apple next week, or a strong one from Alphabet the week after, could bring a new name to the top of the world’s most valuable companies list. Investors are, however, prone to overconfidence in technology trends. Facebook is snagging more and more ad dollars. European antitrust authorities are circling. Moreover, some of Alphabet’s revenue comes courtesy of iPhone users: it cost Google $1 billion in 2014 to keep its search bar on the Apple device, Bloomberg reports based on transcripts of a court case. Alphabet is far more reliant on Internet advertising than Apple is on the iPhone. Ads bring in about 90 percent of the company’s revenue. Any hint of investor skepticism about that market could keep Apple at the top of the list. Unemployed young people from the Tunisian city that touched off nationwide protests say the government is failing them and protested anew Saturday in a precarious calm enforced by a nationwide curfew. A lawsuit claims the chain was trying to protect its stock price. Chipotle has reportedly been hit with a lawsuit that claims the chain attempted to conceal a norovirus outbreak. The class-action, filed on Tuesday, raises questions about an outbreak at a Simi Valley, Calif. location that affected at least 234 customers, NBC reports. The lawsuit states that a kitchen manager who was suffering symptoms continued to work at the restaurant from Aug. 18 until he was diagnosed with norovirus two days later. It says that when at least two customers had complained they were suffering symptoms, Chipotle CMG -1.59% attempted to cover up the outbreak instead of immediately alerting authorities. The complaint accuses Chipotle of “disposing of all food items, bleaching all cooking and food handling surfaces and replaces its sick employees with replacement employees from other restaurants before notifying county health officials.” The manager of the food safety program at the Ventura County Environmental Health Division says that this prevented authorities from conducting certain investigation procedures, including sampling the food. Chipotle had been enduring a string of food safety issues at the time, and the lawsuit claims that the fast casual restaurant tried to cover up the newest outbreak in an attempt to prevent damage to its stock price. The forecasts of lackluster sales by companies including Taiwan Semiconductor Manufacturing Co (TSMC), the world's biggest contract chipmaker, and smartphone camera lens producer Largan Precision Co Ltd add to concerns about Apple's outlook amid slowing global demand for smartphones. But TSMC, which makes some of the chips that go into iPhones, forecast this month that first-quarter revenues would likely fall by up to 11 percent year-on-year, adding that demand for high-end smartphones would also be weak. An 11 percent quarterly decline would be the steepest revenue drop for TSMC in almost 7 years, Thomson Reuters data shows. First-quarter revenues at both LG Display and Hynix are expected to fall around 10 percent, according to Thomson Reuters I/B/E/S data.